Kurt Busch scored the Busch Pole Award and accompanying Henry Repeating Arms Big Boy lever-action rifle Friday afternoon at Texas Motor Speedway. 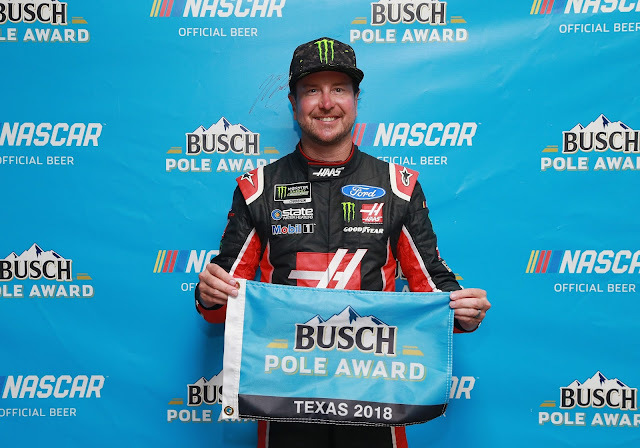 Qualifying for the O’Reilly Auto Parts 500 halted after the first round because of lightning in the area, and Busch was the beneficiary with a lap of 27.360 seconds at 197.368 mph in the No. 41 Haas Automation/Monster Energy Ford. Stewart Haas Racing teammate Kevin Harvick put the No. 4 Busch Light Ford on the outside pole with his (27.395 seconds, 197.116 mph). The most recent Monster Energy NASCAR Cup Series winner, Clint Bowyer, rolls off third giving Stewart-Haas Racing the organization’s first 1-2-3 start. Penske’s Ryan Blaney starts fourth in the No. 12 Menard’s Ford, fastest of the “New Kids on the Track.” The Toyotas of Denny Hamlin and Martin Truex Jr. roll off side-by-side on the third row, breaking up the blue oval party, though Joey Logano slipped in at seventh, followed closely by Kyle Busch in the eighth position. The Chevys of Jimmie Johnson and Kyle Larson round out the top 10. Track conditions on Sunday will be radically different than for qualifying and for practice Saturday, so teams may not have gained much, if any, information that will help them on race day.